The Third Party Inspection for Control Panel article provides a sample procedure/instruction for control panel testing and inspection in manufacturing shop. You might need to review this article with the control panel inspection and test plan. This content guides you through all the necessary stages in the production of the control panels, including the raw material, final inspection, preservation and packing, and dispatch to site. You need to take this point into account: this article is written for a typical control panel and might not be detailed for special cases. All control panel inspection and testing is done against the approved drawings, purchase order specifications, purchasers or company standards, and within the practices and rules of the country, state or province and any government decrees, laws, ordinance or regulation as may apply. The applicable codes and standards may be based any international standards. This content is general and can be useful for all recognized standards. 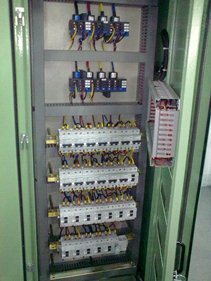 The first actual inspection work in the control panel is the raw materials inspection. Then the inspector witnesses the materials identification on the certificates against the materials marking. It is also necessary to check these with the control panel drawing datasheet, material list and other specifications as appropriate. When the control panel raw material inspection is carried out, and the results were satisfactory or non-conformities were closed by remedial action, then the control panel manufacturer will start fabrication. The third party inspector checks the following points on the control panel, based on the inspection and test plan (ITP), which has already been agreed upon between the purchaser and the control panel manufacturer. Paint inspection including blast cleaning (SSPC-SP 10 or 5), surface profile, Dry film thickness, colour, etc. It is necessary the results to meet drawings and applicable standards. The third party inspector checks that all instruments, compartments, control switches etc. are correctly rated and are correctly located, with specified labelling in accordance of approved drawings. Insulation resistance is measured between control circuits and earth (with sensitive devises excluded) with a 500V Megger. Similarly, insulation resistance is measured in all applicable permutations for any power circuits, if these are included within the control system, with a Megger selected to the voltage calculated appropriate to the applicable specification. The test result depends to the circuit but would not be acceptable if it is less than 2 Megohms. Power frequency voltage of 1.5 kV is applied between control circuits and earth for 1 minute. Similarly power frequency voltage, calculated appropriate to the applicable specification, is applied to all applicable permutations for power circuits for 1 minute. The test would be acceptable if the no flashover and puncture occurs during the test. The test would be acceptable if all the mechanisms work correctly. It is necessary surface condition to be free from pin-holes, runs damage and other discontinuity. The third party inspector provides an Inspection Visit Report (IVR) after each visit, as well as a final report summarizing the activities carried out during the control panel production in accordance with the contract requirements and circulated within the time limits specified in the contract. The report is in the format required by the client and clearly indicates final acceptance or rejection of the control panel. When required by the contract or purchase order, a release note is issued by the third party inspection agency and given to the manufacturer when the control panels have been accepted.